While the first poise in the unfolding of Knowledge-Will that manifests the creation is that of the unmanifest Sachchidananda and the subsequent poise is that of the primary Supermind which holds the creative idea and vision as an in-built program, the next poise is the secondary, apprehending status of the Supermind where the in-built program of creation that is held in the primary Supermind is geared for execution. The triune yet unitary complex of Sachchidananda (Existence – Consciousness-Force – Bliss) starts getting differentiated without losing their linkage and without abrogating their oneness. This movement of differentiation implies a dynamic and a totipotent Power at work, a Power that is the prime-mover in the realms of the Infinite. 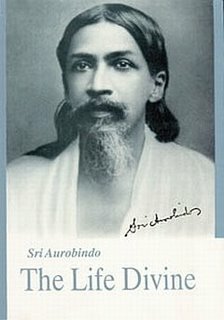 Sri Aurobindo explains that this creative Power is an exceptional Power that is the ‘pure’ Power of existence and is represented simultaneously by ‘Consciousness’ and ‘Force’ which are its twin essential aspects (The Life Divine, pg 156). With the unrolling of the manifestation, the twin aspects of the Pure Power of existence get expressed as ‘Knowledge’ and ‘Will’ that need to be understood in cosmic parlance as Universal Knowledge and Will (and not in terms of the ordinary mental working where they do not exist integrally but are separated and often in conflict). The original Consciousness and Force that get expressed as the Universal powers of ‘Knowledge’ and ‘Will’ to create a world of relations need a matrix for manifestation. This creative matrix is provided by the Supermind projecting ‘space’ from a non-spatial Reality through an objective extension of Consciousness and by projecting ‘time’ from a timeless Reality through a subjective extension of Consciousness. Thus, Knowledge and Will ‘must be one , infinite, all-embracing, all-possessing, all-forming, holding eternally in itself that which it casts into movement and form. The Supermind then is Being moving out into a determinative self-knowledge which perceives certain truths of itself and wills to realize them in a temporal and spatial extension of its own timeless and spaceless existence’ (Ibid).